Same house, two versions. Which do you like best? 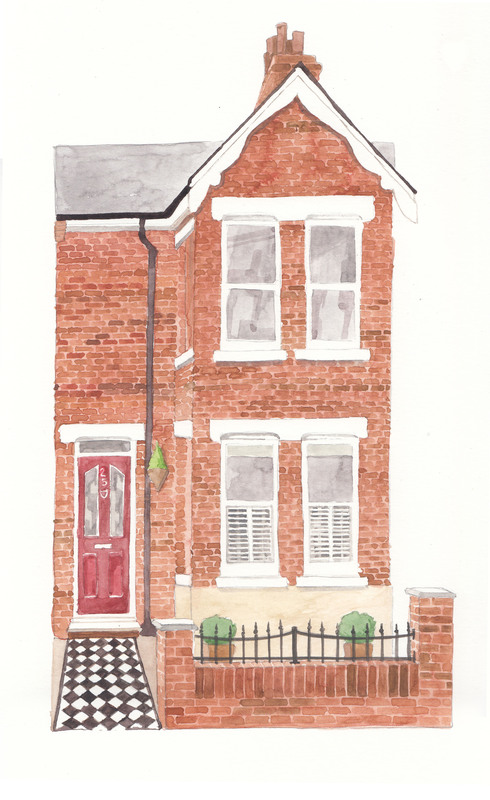 I was commissioned to draw a house for a couple who are moving and leaving this one, presumably their first house together. It happens to be a really nice house to draw but that isn’t why I drew it twice. I began drawing it and then colouring it, using watercolour, thinking I would ‘draw’ most of the detail with coloured pencils much like the butcher’s shop I have also drawn a few times. However, as the work progressed I liked the pure watercolour and lack of line so much that I continued in that way. Only, I was using cartridge paper and you can see the ‘dotty’ effect where the lower-quality paper has absorbed the colour unevenly. It makes for a quite nice effect, but for a commission, I didn’t think it looked professional enough. Then there was the small inaccuracy of the wall where it meets the path (you wouldn’t really notice immediately). The matter of the roof stretching over more than just the house I was focusing on (at an earlier stage the ‘greyed-out’ buildings weren’t in place but the roof was). I realised that this wasn’t working but rather than starting again immediately, I continued to the point of adding the ‘greyed-out’ buildings. It solved the roof problem effectively but I realised that it was worth starting again (I tend to get grumpy and dissatisfied if I’ve not done what I consider to be the best job I could’ve done) and went to buy some watercolour paper; smooth, 300mgs (no ‘spotty’ effect) – hence the second, more ‘planned’ and considered final drawing you see here. I’m glad I did. Don’t forget that I have long had a phobia of drawing architecture…! I still like both drawings, and yet as an exercise in professionalism it has been a useful learning experience. I’ll know exactly what to do next time. So, on that last point then: Anyone out there want to commission a memento of their home? 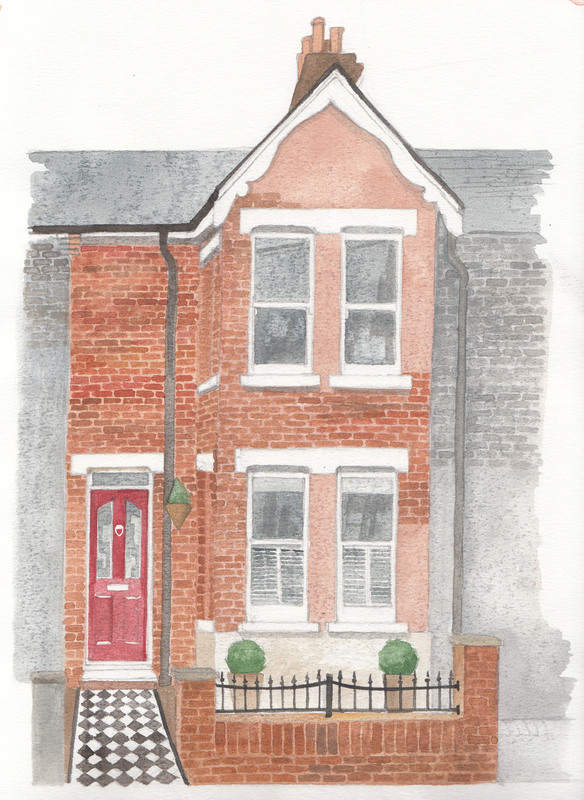 [I can draw it from a photo/Rightmove/Zoopla or Google Street view (so long as there isn’t a large Sky van parked outside at the moment the Google car came by)].